Photodumps: How Do They Work? 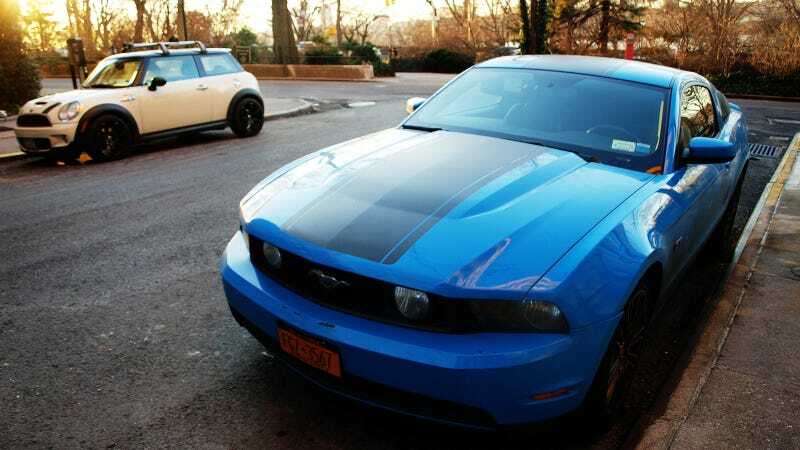 One of my favorite cars in my neighborhood, this Grabber Blue Mustang GT, parked across the street from a Mini Cooper on nice wheels just in the line of a sunset the other week. I was happy to have my camera on me. So it makes a good opportunity for me to test and see how photodumps best work in Oppo. Can I run a big post full of pics with a jump tag without spamming up the whole page? If so, that's wonderful and I'm happy. Also, Minis look kinda chubby nowadays. Also, this mustang has stupid rear-quarter-window covers that do nothing but cover the window completely. No holes, no visibility. Dumb. But it otherwise looks amazing rolling past a bunch of white, grey, and beige family sedans and crossovers. It's not as nice as the '79 Turbo Trans Am or the Series 3 Jag XJ6 (both in brown) that live around me, but it's still a nice pick me up every time it drives by.